Hi guys! Hope you had a great weekend, we did- complete with the most indulgent Sunday ever. If you watched me on insta-stories you would have seen a first class binge taking place. We have kind of been doing a one-meal Sunday type of situation where we wait and eat one big meal while we watch the Seahawks mid-day and then that’s about it. So Pete made GF cauliflower macaroni and cheese with goat cheese for everyone else that was over (of course I was the only one who couldn’t eat it since the girls do fine with some occasional goat cheese) so I made and ate an overboard amount of this salad with grilled chicken. Also, tater tots. Also, I made chocolate chips banana bread from Pure Delicious and these cookies with coconut, cranberries, sour cherries and macadamia nuts added to them. I ate too many of them in case you were wondering. I also announced that a week from today (the 16th) Pete and I starting a Whole30- let me know if you are interested and I will journal it again! I would start tomorrow but I am stage momming for Coco while she films a movie in Eastern Washington on Monday (who IS she!?) and then Pete and I are going to be in New York for a few days. But when I get back I am going to be super focused and get myself together Whole30 style! Ok- enough babbling about my over-eating of cookies, lets talk about this beautiful Fall dish that is just what you need for this weeks dinner! It is easy enough for a Monday night, but elegant and special enough to serve at a dinner party! I like it with these Whipped Sweet Potatoes or with Crispy Ginger Rice. And the COLOR??!!! So pretty and so delicious- a winning combo! Put a cast iron pan over high heat and add the olive oil. While the oil gets hot sprinkle the tenderloin with kosher salt on all sides. 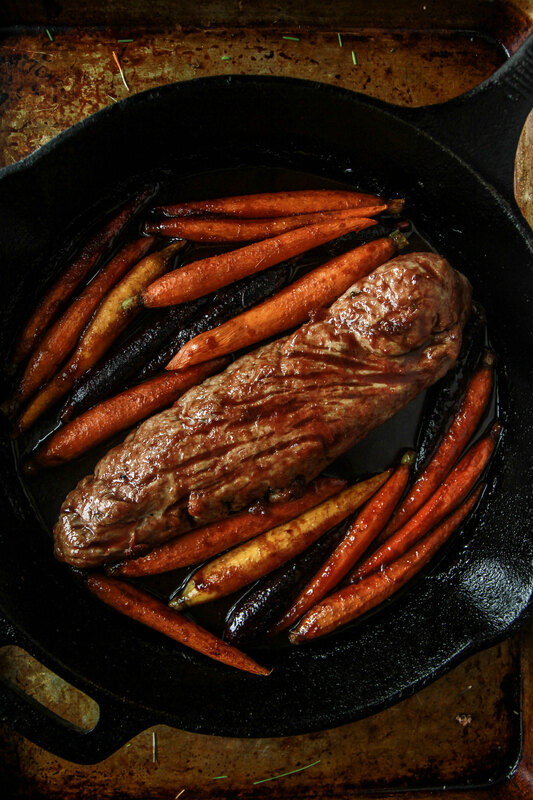 Place the tenderloin in the hot pan and add the carrots to both sides. Sear the tenderloin on all sides until golden, about 1 minute on each side. Meanwhile add the ginger, garlic, honey, tamari, vinegar, sesame oil and juice to a pan and bring to a simmer. Whisk well to combine the melted honey in. Add the sauce to a blender and puree on high. Season to taste with kosher salt. Pour the sauce over the pork and carrots and place the pan in the oven. Roast at 375 for 15 minutes. Remove the pan from the oven and transfer the pork to a cutting board to rest. Transfer the cooked carrots to a serving platter and then put the pan with the sauce over high heat on the stove pot and simmer until the sauce has slightly thickened. Slice the pork and arrange it on the platter with the carrots and then pour the sauce over the top of the pork and carrots. Sprinkle with the pomegranate seeds and serve hot. Your photos are beautiful and tasty. The dish looks really yummy! YUM! Okay curious – in a breakfast rut and have celiac and don’t handle eggs (scrambled/hard boiled, etc) well for breakfast and wondering what you go to for whole30 breakfasts?? This looks SO flavorful! I’m literally drooling. Glad you had a fun and indulgent Sunday! Omg, Heather!! This looks SO good. Perfect holiday meal! Love the pomegranate addition! So pretty! haha i need to go see your IG stories! This looks fab. I would so make this versus turkey for thanksgiving. We love pork! This is definitely a dish that looks special! Delicious! It only had to bake for 15 min? Doesn’t seem like it would be cooked through. Just checking. It does Cher! I promise! Looks wonderful! Is there any substitute for the oil if my husband has a sesame allergy? Absolutely- I would just use vegetable or olive oil. 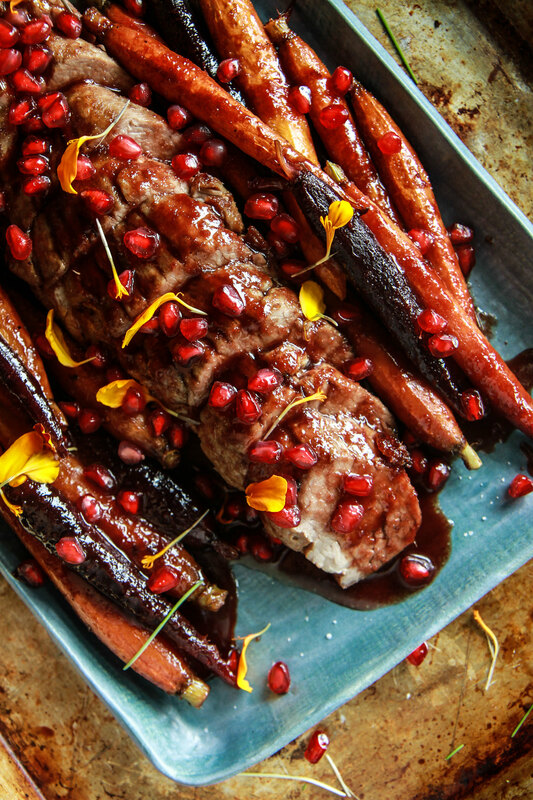 This is so yummy and interesting pomegranate ginger roast pork tenderloin carrots. I tried this kind of recipe before but this is unique. Instead of 1 tablespoon olive oil i took 1/2! Thx for sharing! I will try your variant, Heather! The recipe looks good, but what is Pomegranate Ginger Sauce? The Pomegranate Ginger sauce is made up from the ingredients below it. How big is the tenderloin, weight wise? I have a go to date and onion jam stuffed tenderloin recipe but this looks like something I won’t regret trying instead. 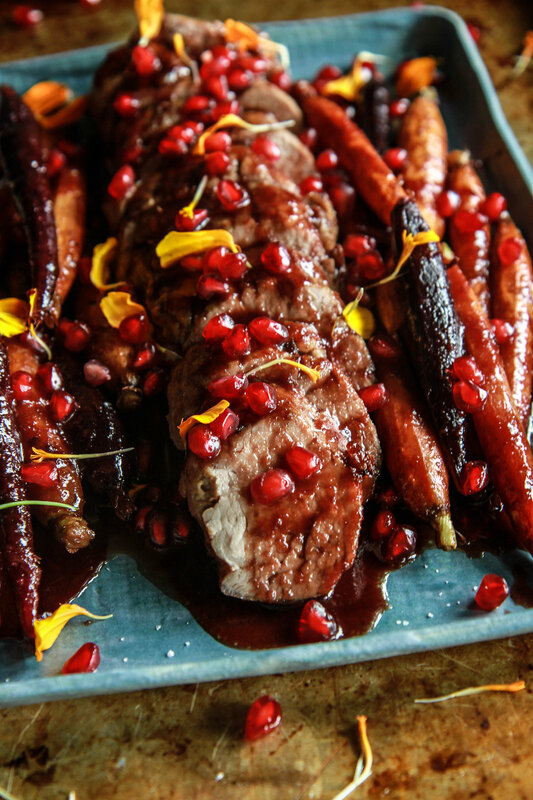 Amazing pomegranate ginger roast pork tenderloin carrots! Combination of taste, I like a balanced diet, a variety of vitamins in it. I really like. 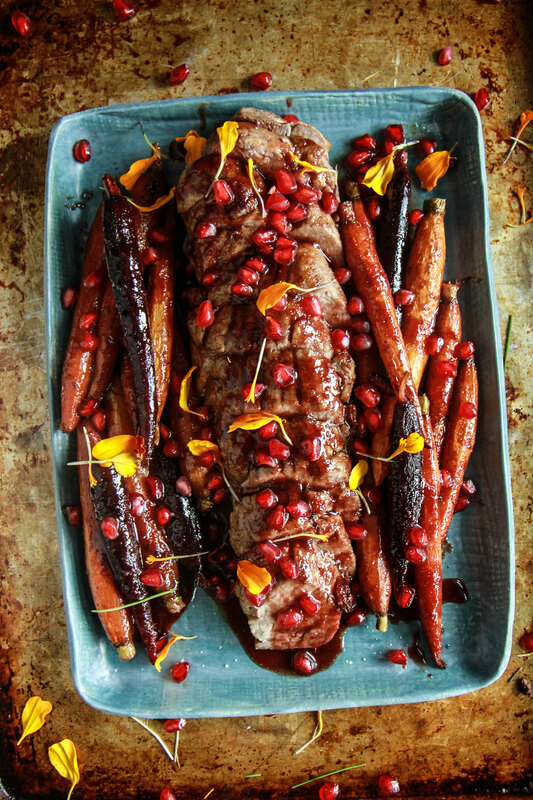 Absolutely love your creative idea with pomegranate ginger roast pork tenderloin carrots! Can I post it on my blog? Thanks for sharing!